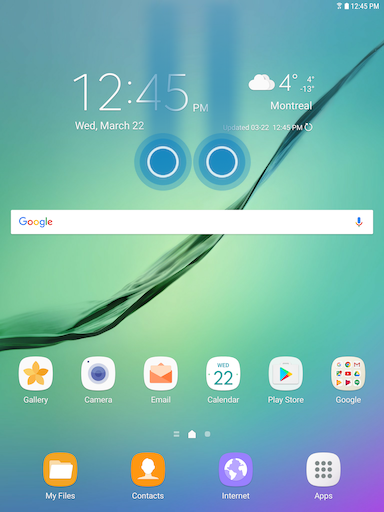 How do I stop the screen from automatically rotating on my Galaxy Tab S3? The Auto rotate feature uses an internal sensor to detect when you rotate your device, and it adjusts your screen accordingly. The feature is turned on by default and can be turned off and locked in Portrait mode by following the steps below. 1. 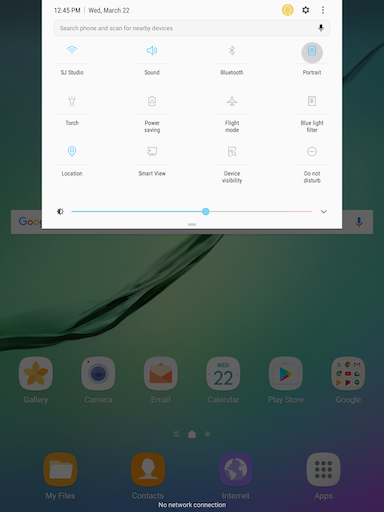 To open the Quick Settings Panel, swipe from the top to the bottom of the screen, using two fingers. 2. Touch Auto rotate in the Quick Settings Panel. The screen will not rotate anymore when you rotate the device, as you activated Portrait mode. 2. To turn Auto rotate back on, touch Portrait . The screen will now rotate again when you rotate your device.